Growing up, stockings were always an important part of the holiday tradition in my household. On Christmas morning they were the first things that my sister and I could touch. And what a bounty! Looking back, it was a lot of little crap, but my mom knew exactly the kind of crap we would go nuts over. Since I’ve been with my husband celebrating Christmas, I’ve reinstating stockings. From socks to swanky sunglasses, anything goes. However, if I was going to choose some items to put in there for all of you readers, here’s the loot you’d get! Let’s light a champagne scented candle (when it’s done you get a new cup!) and juice a couple limes. 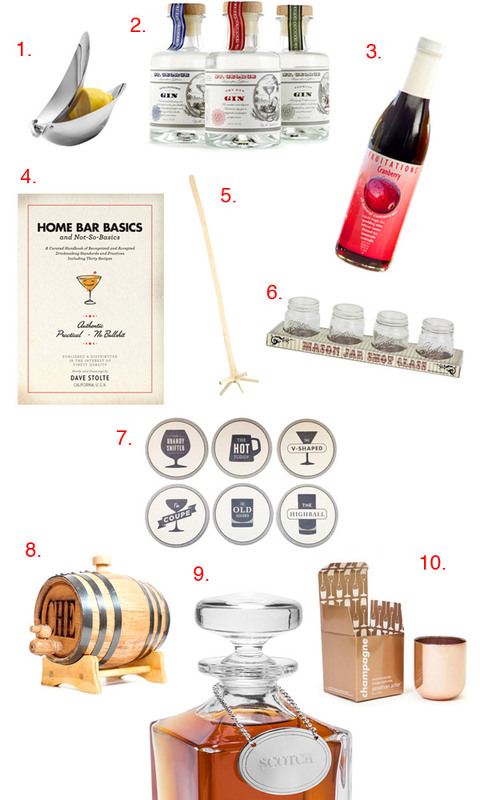 Break open your copy of Home Bar Basics and contemplate how you’re going to personalize that barrel you’ll be aging a Negroni in later. It’s the holidays, so let’s mix up that all natural cranberry syrup with some gin. Shoot it back, or get out the coasters?